Cold. keep it close covered for youre use. take of this Electuary with a bruised Liquorish stick when troubled with shortness of breath. 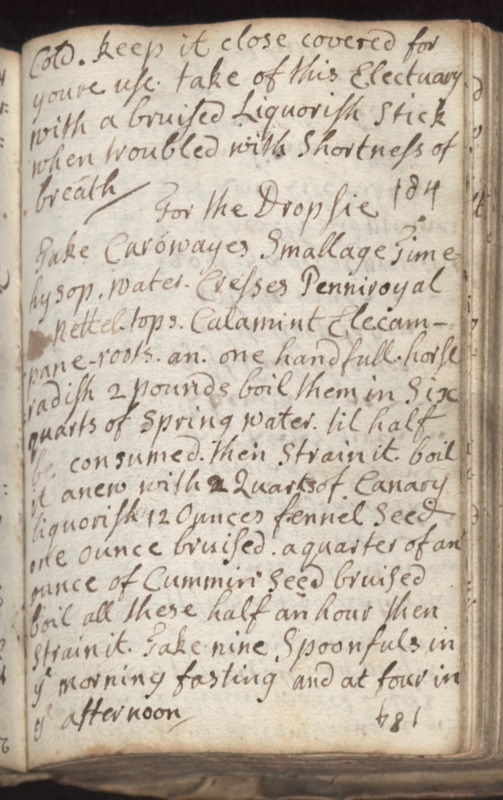 For the Dropsie Take Carowayes Smallage Time hysop-water. Cresses Penniroyal Nettel-tops. Calamint Elecampane-roots. an. one handfull horse radish 2 pounds boil them in Six quarts of spring water. till half be consumed. then strain it. boil it anew with 2 Quarts of Canary liquorish 12 Ounces fennel seed one ounce bruised a quarter of an ounce of Cummin seed bruised boil all these half an hour then strain it. Take nine Spoonfuls in ye morning fasting and at four in ye afternoon.